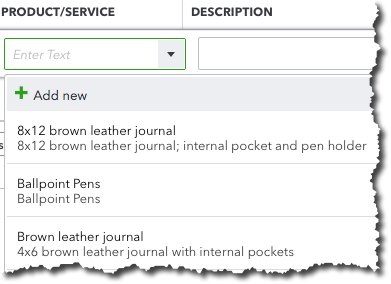 Last month, we created QuickBooks Online service items. This month, we’ll explore how they’re used on the site. If you ever did your accounting manually, you probably remember how tired you got of writing or typing the same things over and over. You may have had your customers’ addresses practically memorized, and your product price list was always close at hand, though you knew that by heart, too. QuickBooks Online eliminates that duplicate data entry, saving time and reducing errors dramatically. Because of the service records you’ve created, completing sales and purchase forms can now be an easy, accurate task. You’ll also have fast access to information about your inventory levels and the profit you make on items. You’ll know what’s selling and what’s not, and when it’s time to reorder. Much of your accounting work probably consists of filling out forms. Whenever you create one of these invoices or sales receipts or purchase orders, you already know that you can open a drop-down list and select the name of a customer or vendor. QuickBooks Online lets you enter data about what is being bought or sold in the same way. To see how this works, open an invoice form and complete and/or verify the fields at the top (customer, date, terms, etc.). Click in the first PRODUCT/SERVICE field, and then click the down arrow to see the list of items and services you sell. When you create a sales or purchase form, you’ll be able to select the appropriate service item from the drop-down list – or add a new one. When you select an item, the description and price will fill in automatically. You’ll have to add the quantity and click in the box below the column labeled Tax (if applicable). QuickBooks Online will calculate the total cost of the service item on that line. If you need to enter additional sales, proceed to the PRODUCT/SERVICE field in the second line and repeat those actions until you’re done and can save the transaction. What do you do when you need more information about a specific product than just its description and price? Do you have to return to its individual record? QuickBooks Online’s Products and Services page provides real-time inventory updates, as well as item-management tools. As you can see, there are a number of actions you can take here on individual products. Warning: If you think there’s a reason you should Adjust quantity or Adjust starting value, please talk to us first. Your inventory records need to be precise. We can schedule a session to go over this and other concepts you need to understand in order to keep inventory counts accurate. You can take some of these actions on multiple items simultaneously. Click the down arrow in the Batch actions field above this Edit menu. Click the boxes in front of the products you want to work with and select the desired activity (unavailable ones will be grayed out in the list). Take extra care with this mass modification tool. QuickBooks Online contains templates for numerous inventory-related reports that you can customize. 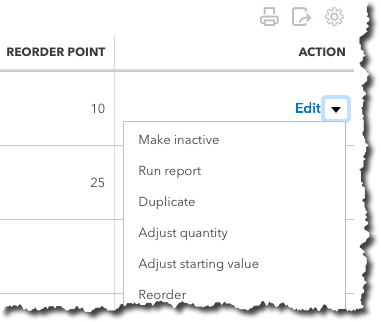 Reports are easy to run but can be difficult to customize correctly and interpret. If we’re not working with you already on the complex standard financial reports that should be reviewed monthly or quarterly, talk to us. The more you understand about the financial status of your company, the better your decisions will be.